This makes me sad because it’s true… or if not dreams, than at least wishful and wistful fantasies while half asleep. I used to have to sleep too little at night, then nap during the day because of my job. 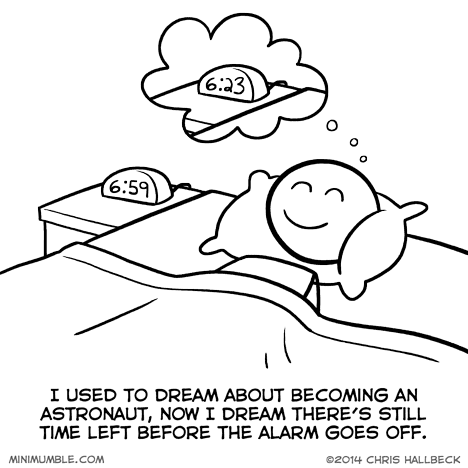 During that time, I’d often dream that the alarm was about to go off (sometimes I’d wake up and see that there were still hours left). That was no fun. I went to sleep at 20:30 last night. I sure love being in the working class. Better than being an astronaut always dreaming there’s still time left before the alarm goes off. I have the opposite problem. I wake myself up early because I dream that I’ve overslept.